MSV: Councilwoman Tiffanie Fisher: Nixle system "used for political propaganda for the mayor and political attacks"
Councilwoman Tiffanie Fisher: Nixle system "used for political propaganda for the mayor and political attacks"
Revenue, Finance, and Infrastructure – Chair for the 4th year. Its what it sounds like – Budget, all infrastructure projects, and also administrative topics. Community Development North – NW Park, North End redevelopment plan, any redevelopments in the northern half of Hoboken. Zoning – mainly looks at updates to our zoning code. Affordable Housing – looking to find ways to add affordable housing in Hoboken. Health & Human Services – this includes the recreation department. City Council Meeting. - Tonight (1/16) 7PM. Click for the agenda and to watch online (link appears when the meeting starts). You can watch live on Facebook as well. Includes a presentation on the proposed historic rehabilitation of Court Street and Castle Point terrace. Plastic Bag Ban – 1/22 goes into effect so be ready. Support & Resource Fair - Hoboken’s Special Needs Parents Group - 2/2 2:00-5:00 pm Hoboken Elks Lodge 1005 Washington Street. Pre-K 3 and Pre-K 4 information session – 2/6 9:00-10:00 am. Actual registration week is 4/1-4/5. Click to find all the information you need about the program. Last week the Appellate court rendered what I personally believe will be the last ruling in the long litigation. You can read the ruling HERE. Effectively what this means is that Applied / Ironstate has no further barriers to being able to build. This has been a frustrating process for everyone involved. This being said, I and many believe that if offered a better way to keep or exceed their economic value in the Monarch site, that Applied / Ironstate would consider and arguably prefer not building there. It is a difficult site to build on – not only would they have to reconstruct the entire platform, but given DEP environment restrictions on not building in the water during migration season, the time to build will be longer than other buildings. Additionally, although the building feels big – it is actually only 150K square feet across 77 residential units with a lot of common space that will be costly to build and does not generate revenue. Mayor Bhalla has been in negotiations with Applied/Ironstate and at the last council meeting, the City Council approved hiring an appraiser to evaluate both the Monarch site and the Hoboken’s DPW garage. Once the city has a better understanding of what the net value of Monarch is we can then better understand if there is a trade that can happen that would be satisfactory and beneficial to all parties. So more to come... PS on this – I am told that Toll has included Monarch in its sales materials for its nearby properties. They don’t know more than any of us – they are just having to protect themselves and disclose the possibility of it being built. I am befuddled. More meters. Increased rates. I wanted to include some sort of link that would give you more information, but alas, there are none... As I have stated before, I opposed most of these changes mainly driven by the City’s lack of communication on such an important topic. But one, in particular, I want to make sure you are aware of is that electronic meters have been “installed” citywide converting all free, four-hour visitor parking to metered parking. 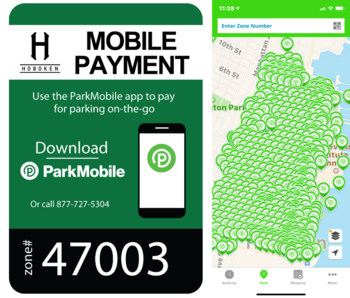 To use the meters, you need to either use the ParkMobile APP or call them and pay by credit card (see sign below). Latest update. City Council approved an ordinance for 3 medical marijuana dispensaries on December 19th. I voted 'no' because the legislation does not include, in my opinion, the proper oversight and management of the licenses (one person is contemplated to make those decisions as opposed to a board/committee). Two of my council colleagues are working on making revisions that will hopefully address this issue. Of note, Hoboken was not selected as a location by the state for the dispensary so we will not see establishments anytime soon. That night I sponsored a parallel, protective ordinance that would have temporarily made all other marijuana establishments a prohibited use under our zoning code until after the State voted and we agreed on a plan for recreational use in Hoboken. This would give us time to figure out what makes sense for Hoboken, and not allow applicants to circumvent the process and seek and receive approval from our land use boards / officers. This type of legislation was passed in a number of cities across New Jersey, including many of our neighboring ones like Weehawken and Union City. Although I thought I had the support of most of the council going into the meeting, I was surprised when only four voted in favor so it did not pass. As part of our regular discussion in our infrastructure subcommittee meetings including yesterday’s, I have urged the city to provide better updates on Washington St. which they did yesterday. Long story short, we are in the final stages with the hope that the project will be completed in April. 11th and 13th street corners are being finished and paving north of 11th street will occur when the weather is warmer. You will see work happening up and down Washington Street to address final punch list items which are normal for a project like this (or any project). 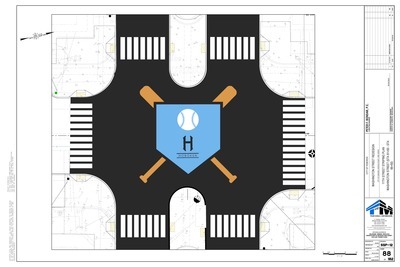 Of note, although we will be re-installing the bases at the corners, we have not yet decided on the design for the 11th street intersection to replace the baseball that is being removed. This is what was proposed by the administration, that the council politely suggested should be reconsidered. Any suggestions are welcome as we look at redesigning it. With a new year comes a new communications manager for the city of Hoboken and apparently a new philosophy that the City’s emergency and community alert system should be used for political propaganda for the mayor and political attacks against certain city council members. The two messages that are prompting this are the ones sent out on January 10th and January 11th. Not only is this not appropriate on any level, it is also a breach of the Terms of Service under the city’s contract with Nixle. Nixle is an important tool for our community and one that we should not risk losing because of actions like this. I appreciate the feedback that several of you (and others) sent to me, other council members and the mayor about your frustration with the politicizing of community messages. I encourage more of you to do so and, if interested, to come to the City Council meeting tonight to let the entire council know that it is not acceptable and help us nip this in the bud. I have reached out to the mayor and business administrator on this (no response yet), have sponsored a resolution requesting an end to this practice that will be voted on tonight and will be submitting a letter today from six of nine council members to Nixle requesting that they take action as well (yet preserving this important service). Please note that nothing is stopping the mayor from using his own personal / campaign email for whatever message he wants to put out, but we feel strongly, and I hope you do as well, that Nixle, as a city platform, or the communications manager, as a city employee, should not be used for political purposes. Hoboken is a very special community as I know all of you are aware. And a hidden strength of our community is the many examples of our broad commitment to those with special needs. The Hoboken Special Needs Parents Group is one of those many examples. Founded by two amazing moms (both 2nd ward!) - Sheillah Dallara, who is also on Hoboken’s Board of Ed, and Megan Yavoich, who is also a children’s ministry leader at Hoboken Grace. They and the group are a wealth of information for parents who are seeking more support, resources and information as they care for their children with special needs. Please go to the HSNPG website to find out more information. And I hope you will attend their first ever Support & Resource Fair on 2/2. I want to thank everyone who donated to my fundraiser for the Together We Rise shopping spree for foster teens. Because of your generosity, we raised almost $1000 to help fund a shopping spree for 10 teens. I have to say, that it was a very moving and emotional experience. Any child separated from their family is only done so for safety reasons. The goal is to keep families together. But sometimes it just doesn’t work out. Teens in foster care are particularly heartbreaking to me because they are often less apt to find a forever home. At the event, I shopped with two sisters – 14 and 16 - who were together in a loving foster home. 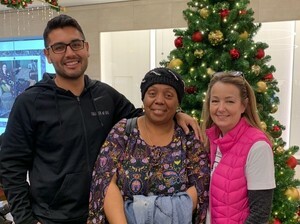 Although typically not allowed, the foster mom shopped with us and helped them decide how to spend their money and you could see how much the girls seemed to appreciate and love their foster mom. You are also not allowed to ask about their story, but the foster mom told me how good both girls are and how both want to be with their mother but their mother disappoints them weekly by not showing up or to not doing the things required to regain custody. It was heartbreaking and inspiring at the same time. I spoke with Danny about the possibility of doing an event like this closer to our own backyard, maybe at Newport Mall and will also speak to the incredible Bev Savage, our Hoboken neighbor, who runs CASA for Hudson County. Let me know if you would like to help put this together. Finally, with this, we officially start together the last year of my first, four year term serving you. If this past year is any indication, it is going to be a constructive, albeit bumpy year. I want all of you to know that I am 1,000% committed to working and getting things done for you. The reality we live in is that we are in an incredibly political environment like Hoboken has never seen. And my guess is with the upcoming elections this fall for all six ward seats, and a mayor who has announced that he wants to run a slate against all incumbents (whoever decides to run), that it probably won't change. But notwithstanding the politics that you may witness, know that often not seen is the constructive dialogue between the council and City Hall, that A LOT gets done, that I regularly communicate with the mayor on important issues, and that the city council votes in support of the mayor’s agenda 90+% of the time.